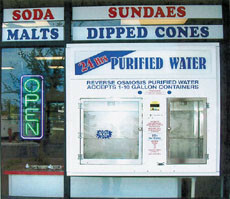 The window vending machine from Advanced Water Systems, of Phoenix, is perfect for any water store, car wash or other type of store that sells purified water or reverse osmosis water. It installs easily in the storefront window, wall or other structure. It’s available in stainless steel or can be powder coated any color. It’s NAMA listed and accepts nickels, dimes, quarters and one-dollar bills. Money is removed from the inside of the store to help decrease vandalism.